It took Conrail maintenance-of-way forces less than three days to repair heavy damage to its Lehigh Line, a busy main line used by New Jersey Transit Raritan Valley Line (RVL) passenger trains and CSX and Norfolk Southern freights, following the derailment of a 141-car CSX mixed freight late on the afternoon of Dec. 8. NJT service was operating with only minor delays on Monday morning. Conrail crews worked over the weekend during a snowstorm to repair the damage as well as stage NJT equipment in preparation for the Monday morning inbound rush. 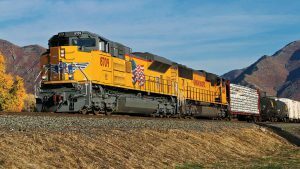 Conrail Shared Assets Operations owns, maintains and dispatches the Conrail Lehigh Line, which runs from Port Reading Junction in Manville, N.J., to Oak Island Yard in Newark. At Manville, the Conrail Lehigh Line connects to CSX’s Trenton Subdivision. The line shares track with NJT’s Raritan Valley Line between Newark and Aldene Junction, in Roselle Park. 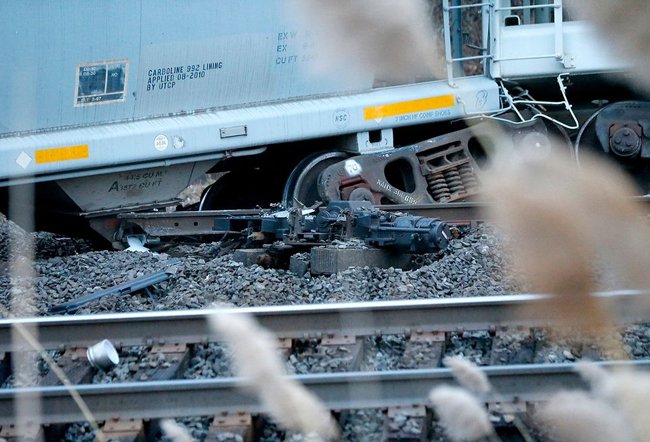 The derailment occurred southwest of Union, N.J., in a mostly industrial area. The CSX train was headed east toward Selkirk, N.Y. There were no casualties. 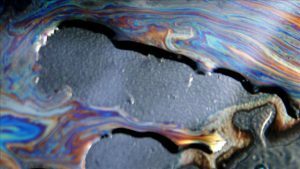 “NJ Transit is grateful that Conrail was able to complete the necessary repairs over the weekend in time to restore regular weekday service for our customers for their Monday morning commutes,’’ said Executive Director Steven H. Santoro. Conrail, working closely with NJT, was able to move four NJT RVL trainsets consisting of MultiLevel equipment to where they are normally staged for weekday morning service. Only one NJT inbound RVL train was not operated on Monday morning, due to speed restrictions following track work. The full schedule was expected to be back in service on Tuesday. Conrail’s National Docks Clearance Project, a joint venture with NS and the New Jersey DOT completed in 2010 to accommodate double-stack trains, made the moves possible for the extra-height MultiLevels. 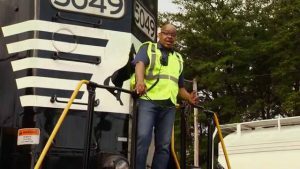 The National Transportation Safety Board and Federal Railroad Administration have not released any preliminary information as to the derailment’s cause. However, it appears to be a broken stock rail on a turnout that had recently been inspected with a defect detector car. The rail break most likely occurred when a westbound loaded trash train passed over the turnout just prior to the eastbound train that derailed. The break was in the web of the rail and not clean-through, so track circuit continuity wasn’t compromised. The rail finally broke and separated completely after the locomotives hauling the CSX train had passed over it. The CSX train derailed in two spots throughout the 141-car consist, a length that is not unusual for freights on this line, going back at least as far as “Big Conrail.” There were three locomotives on the head end; they and the first car separated from the consist. Two cuts of empties that had been placed in the consist between loaded cars during train makeup derailed and jackknifed from run-in caused by the loaded cars behind them. Run-in that derails empty cars is not so much a factor of train length as it is train makeup. The GAO (Government Accountability Office), the investigative arm of the U.S. Congress, recently launched an investigation into the safety of “increasingly long” freight trains operated by Class I railroads “to boost profitability,” Reuters reported a few days before the accident. 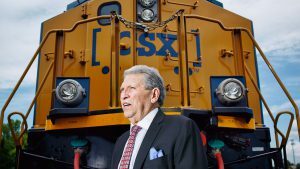 CSX told investors in October its freight trains have increased more than 400 feet to 6,833 feet on average since March, when CEO Hunter Harrison launched his “Precision Scheduled Railroading” operating plan.